Most of them have been abandoned by their families but the over 10,000 widows in this city of Lord Krishna have also been abandoned by the country's electoral process as they do not have voting rights in Vrindavan. Living in pitiable conditions as one can find them begging on the streets or waiting for meals outside ashrams, these hapless women want that the political candidates should come and see their conditions and let them have a say in the election process. Manju Roy, who lives in the government ashram, was waiting for her turn to get some rice and dal outside Radhe Shyam Ashram at 8 am. When she came to know that Hema Malini is contesting elections from Mathura, she wanted the actress to come and see their plight. "Hema Malini is a big star. Please tell her to visit us and see how we live. We want to vote but who will arrange voter IDs for us," Roy says. "We somehow managed to get Aadhar cards for some of them so that they can avail benefits such as widow pension but none of them have voter identity cards," Santosh Chaturvedi, the manager of Maitri ashram, told PTI. 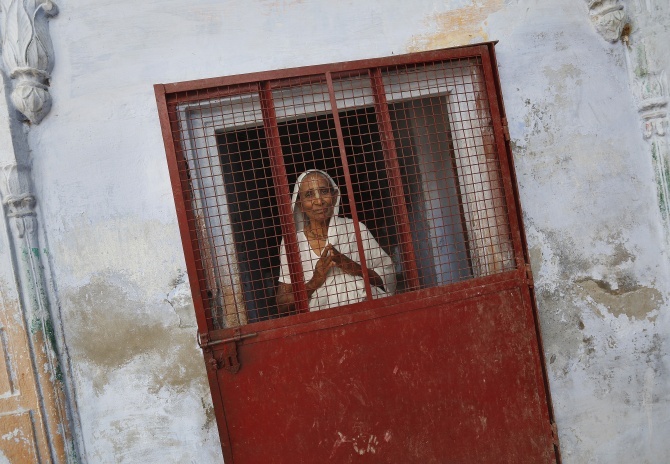 Image: A widow poses at the entrance of a staircase at the Meera Sahavagini ashram in Vrindavan in Uttar Pradesh. amount of Rs 3 and 100-gm of rice for performing bhajan kirtans at various ashrams. Less than 10 per cent have found place in widow ashrams run by the government or Non-Governmental Organisations. They say not a single political party has reached them during this Lok Sabha election as none of them have voter IDs. Political parties have promised to clean Yamuna or beautify Brij Bhoomi in their manifestos but remained silent on the plight of these widows. One of them is 95-year-old Kanchan, who has been living in Radha kund, 21 km from here, for more than three decades. She does not remember any politician offering her any kind of help. 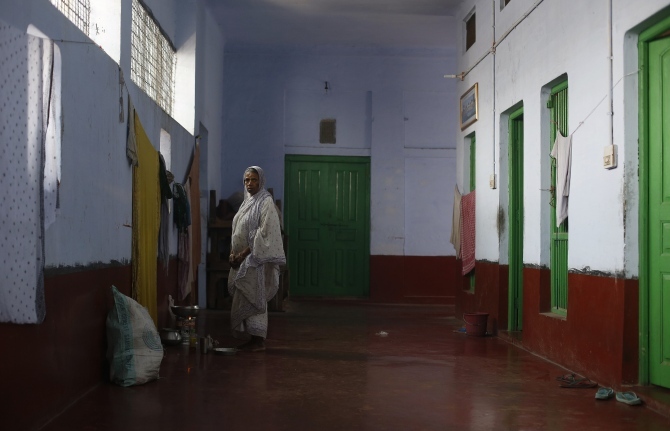 She has been living in Maitri Vidhwa ashram after she was thrown out by her landlord. Around 500 widows get free lunch at Maitri ashrams in Radha kund and Vrindavan while 40 of them have been given space in a hall with a tin shed. They prepare dinner on their own and their world is limited to one bed provided by the NGO. Image: A widow prepares food outside her room at the Meera Sahavagini ashram in Vrindavan, Uttar Pradesh. "When we do not exist for our families, what is our existence for the country? We cannot vote and it hurts, but we are helpless. Our basic concern is two meals and a roof. We don't expect much," says Beena Das, who hails from South 24 Parganas in West Bengal. Basanti Dasi is from Tripura and has been living here for more than three decades. She along with many others have to sing bhajans for four hours daily at various ashrams to get their Rs 3 and 100-gm rice. "We have to beg for food. We are alone without our families and our existence does not matter to society or the country," she says. There are about 400 widows living at the government-run ashram in Chaitanya Vihar here who get Rs 2,000 monthly from Sulabh International, but most of them depend on begging. "I've been living here since the past seven years but no one is worried about us. I don't expect anything from anyone," says Phool Rani from Sagar, Madhya Pradesh. The government ashram was built in 2001 and a new building was added in 2008. One of the employees at the ashram says that apart from some local councilor not a single leader has visited the widows and the case is no different for this election either. 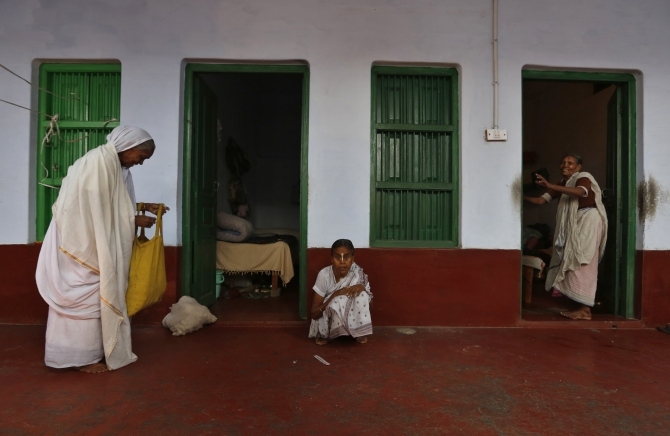 Image: Widows stand outside their rooms at the Meera Sahavagini ashram in Vrindavan, Uttar Pradesh.